From Trazy's Flickr Photostream - you can see it here. He does some awesome macro shots of various biology related subjects. 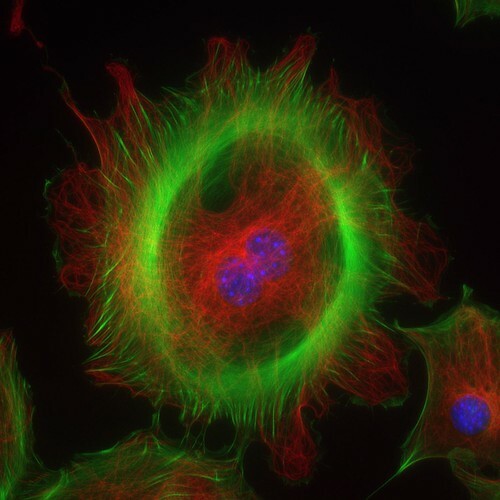 This one is a "monster" culture cell - a huge mutant with two nuclei and one centrosome. A normal cell can be seen at the lower right. Like many who lost friends and acquaintances on 9/11 seven years ago, today will be spent in quiet reflection. Normal blogging service will resume tomorrow. Are colon cancer patients getting enough follow up care? About 150,000 Americans are expected to be diagnosed with colorectal cancer this year. Survival after five years varies from 90 percent for cancer that hasn't spread to 10 percent for advanced cases. According to the results released this week by the journal Cancer, many colon cancer patients aren't getting the screenings recommended after surgery to make sure the disease hasn't returned. The study found that only 40 percent of the 4,426 older patients in the study got all the doctor visits, blood tests and the colonoscopy advised in the three years after cancer surgery. A federal database of cancer cases and Medicare records for patients was used to see if the guidelines were being followed. They focused on those 66 and older with less advanced cancer who had surgery that could cure them. Patients were tracked for three years, beginning six months after surgery. When the study began in 2000, the minimum guidelines called for at least two doctor visits a year, twice yearly blood tests for two years and a colonoscopy within three years. A colonoscopy is now recommended in the first year. Nearly all patients made the doctor visits and almost three-quarters got a colonoscopy, but many didn't get the blood tests that can signal a return of the deadly colon cancer. Overall, 60 percent of the patients didn't meet the guidelines. Of those who did, more than half actually got advanced medical scans like CT scans and PET scans that are not recommended for routine screening. The scans could have been done because of signs or symptoms of a recurrence, but the researchers said they suspect they were done for routine follow-up. There was less screening among older age groups, African-Americans and those with other health problems. It is unclear whether the doctors simply didn't offer the tests or patients failed to get them was clear. The authors suggested that perhaps the follow-up care was being provided by doctors who aren't specialists and unfamiliar with the guidelines. Whether the providers and insurers have a role is also unknown. One is also left to wonder how well screening and follow up is performed for other big cancers such as breast, lung and prostate carcinomas. There is no doubt that detecting cancer and recurrence early will improve overall survival and reduce the financial burden of the disease for all concerned. Eeek, I've been tagged! Now what? I got tagged by my friend Sarah Arrow this morning. She's a lovely Essex lass who is the salt of the earth and would do anything for her friends. You can find her on Twitter or her excellent courier blog. Being tagged is a game bloggers play where they have to write six random things about their self, and tag six other people. It's a great way to spread the word about other people's blogs. 1. I've had every bone in my body x-rayed, courtesy of a wild childhood getting into all manner of scrapes. 2. I'm allergic to animal fur and tend to stay away from furry pets. 3. Curry is my favourite food. 4. I don't mind rain. 5. I am hopeless at music and anything arty. 6. Science was my favourite subject at school. There has been a lot of hype and noise surrounding Steve Jobs' appearance at the WWDC conference and not just because of the new iPhone launch either. His gaunt appearance started a furore amongst the tech analysts and journalists as to how his health was, it was material they claimed. Thus the setting was established for a interesting battle over someone's privacy and control versus the media herd wanting 'honesty'. Yet, Jobs has been very honest up front - his surgery for early stage pancreatic cancer is well known, no more need be said it's a private matter after that. The same journalists who praise research and information about stocks should practice what they preach and check out pancreatic cancer, it's all in the public domain. Fifteen minutes spent researching and reading about the topic would tell them all they need to know, without the rather distasteful and rather slimey hounding that is going on at present. Perhaps it's laziness, but sometimes I'm surprised that people who claim to be experts in one area cannot be bothered to research another in the public domain. It makes you wonder what their motives are, especially in the middle of a new product launch for the 3G iPhone. Take another recent example, Prof Randy Pausch, who sadly died this week from pancreatic cancer. Late last year he gave an inspirational lecture at Carnegie Mellon University but made it clear up front what he wanted to talk about and what was off limits, ie his cancer and his family. His boundaries, like Jobs, on privacy were clear just as the initial medical condition was in both situations. After that, it's nobody's business, you can make your own judgements and act accordingly. This issue is not about control or honesty, it's about money and greed for the investors. A little bit of research goes a long way, even the analysts will tell a novice investor that, so it cuts both ways. We also have to remember that the media prey on negative news and 'noise' to generate interest and readership. You don't see much cheerful or good news do you? It's negative and fearful. Good news doesn't sell. Sadly. Ethnicity and breast cancer - does it matter? Breast cancer research needs to evaluate whether a person's ethnicity influences their response to treatment and its outcome, according to researchers at Imperial College London and published in The Lancet online. Emerging evidence suggests that particular drugs may benefit people from one ethnic group more than others, because of differences in their genetic makeup. Most key trials looking at treatments for breast cancer have been carried out in predominantly caucasian populations in Europe, North America and Australasia. Other populations might not respond to a drug in the same way as the Caucasian populations in these trials. The researchers suggested that clinical trials should record participants' ethnicity and analyse whether there are differences in how patients from particular ethnic groups respond to a particular therapy. One example is a drug called Herceptin (trastuzumab), which is commonly used to treat people with breast cancer that is HER-2 positive. Most studies of trastuzumab have not reported the ethnicity of participants. A recent study showed that people with a particular genotype responded better than others to treatment with this drug. The genotype in question is more common in some ethnic groups than in others, so it could be argued that an individual's ethnicity could be a key factor in determining which treatments are most likely to benefit them. from that in Caucasian and Hispanic women, just as gene expression in Hispanic women differs from both African-American and Caucasian women. In their latest study, Baumbach et al. are focusing on women with “triple-negative” breast cancer. These women are negative for the genes for estrogen receptor (ER), progesterone receptor (PR) and HER2/neu, an epidermal growth factor receptor. This combination is associated with a particularly poor prognosis. Thee results showed surprising differences in normal tissues; some of the differences were specific to African-Americans and were not found in Hispanics or Caucasians. They tended to have a basal-like phenotype and to have an aggressive form of breast cancer before the age of 50. The research also showed that in considering BRCA1 and BRCA2, while they had a lower incidence of deleterious germline mutations but a higher number of missense mutations. They are now doing real time PCR analyses to see if the biggest differences can be validated and proteomic research will follow in the future, making this a large and very important long term study that may influence treatment paradigms in the future.